Thank You for Summer and happy sounds of music playing in every souls and hearts celebrating the most wonderful season in year. As for me this music is jazz syncopated tune of “Hello Dolly” by Louis Armstrong. Miracle has just happened – I have met the Angel of Louis Armstrong and his divine jazz band! The Angel’s name is June Armstrong! Do you recognise him? I did it from the first sight. Marina Chaikovskaya, the artist, has created the angel and I have met Louis Amstrong’s soul in him. The experience is astonishing and I am happy to share it with you. 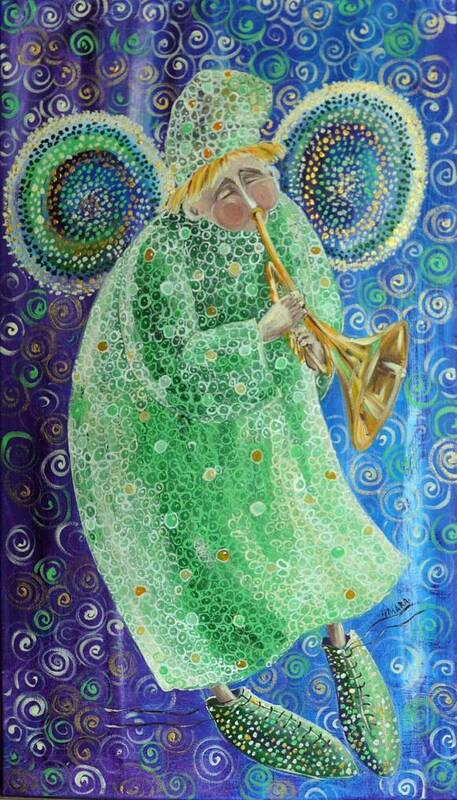 Please, see in these soulfully closed eyes and his living trumpet – the Angel’s inspiration reflects in your own lungs! You know it is extremely difficult to write about jazz. How to describe something aural we can simply feel. 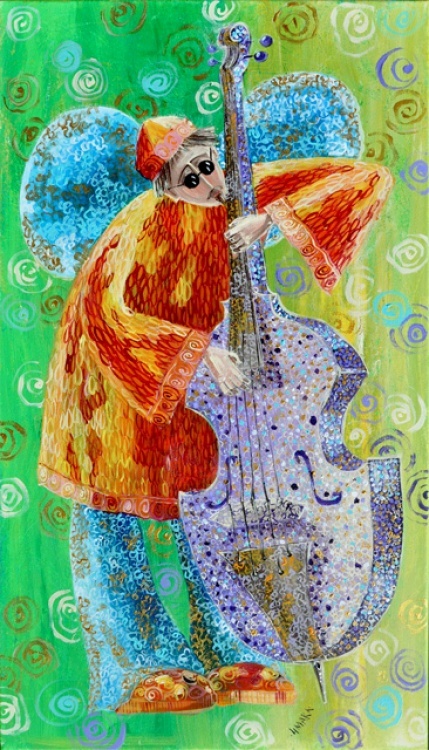 He plays jazz and lives in his music. We are happily dancing with the Angel of Louis. That June-Louis knows how to agitate every our cells! June-Louis’s band is supporting divine rhythmical motion and structure of our whole world. We respond with our bodies and our feelings. As life jazz is built on the unexpected. Louis Armstrong says “My whole life has been happiness. Through all my misfortunes, I did not plan anything. Life was there for me, and I accepted it. And life, whatever came out, has been beautiful to me, and I love everybody.” Accepting life in the full gamma in major and minor is a good lesson from divine June-Louis jazz band we can learn. Thank you for feeling and singing the song. Summer promises to be very happy. We will enjoy June! This artwork is clearly heaven-sent, stunning! You are correct, how odes one describe jazz? Yet, I did feel some of the whimsy and romance through your creative lens. 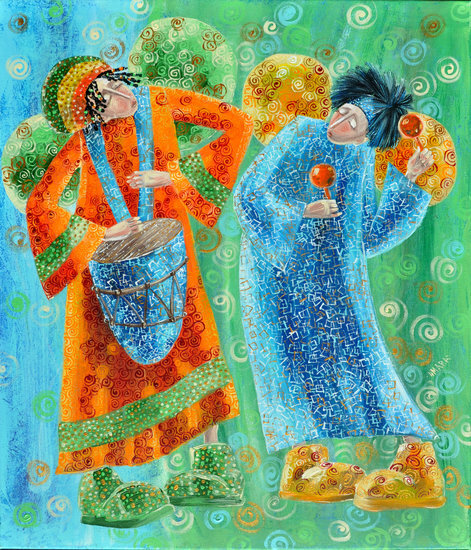 happy art – loved it! Louie will always have a special place in my heart. My son played his “It’s A Wonderful World” at his wedding as his mother/son dance, and I tear up even now thinking of it. Angels are everywhere! I adore your artwork and your beautiful sentiment to describe it. You make the pictures come alive. Thank you Carolyn. You are true Heart Hurt Healer and I love your healing blog. Thank You for You! You are incredibly beautiful. Thank you for being such a wonderful Earth Angel Glorialana.. There is an Angel Award awaiting you here at Dreamwalker’s Sanctuary..
Dear Sue, this Angel Award is the honour for me. Thank you very much! What can be greater than to spread Love and Light we, the Earth Angels, know our aims perfectly. A question twirling in my head “Do I deserve?” reminds about we are earthy angels – doubts are human feature :-). Have a beautiful dreamy day! Hug and kiss your right cheek :-)! Thank you, beautiful Sindy. Have a happy today! That’s an inspirational post, the Art as also the accompanying words. Strange isn’t it how we can sometimes come face to face with angels without realising? Last week I had gone for this inauguration of a cave themed complex in town. And I came across these three wonderful angel like creatures floating in the air as they strummed their musical instruments. Technology notwithstanding, the sights and the sounds made me feel like I was in heaven. What would you call such an experience? PS, my surprise has not arrived yet! Have you checked the post office? I eagerly await my surprise. Dear Linda, thank you for your love to me. We came back from Lithuania yesterday and I am happy-happy to see your sweet messages. I’ll check the post office, of course. Thank you, Eric! Have an inspirational week!